Ein Bustan’s special pedagogy is guided by three main principles: Bi-Lingulism (Arabic-Hebrew), Waldorf education, and Listening Circles. All three of these are incorporated both in our work with the children, as well as in the inner work that we do as adults in the Ein Bustan community, whether we are staff, teachers, or parents. From the beginning, we laid an emphasis on the importance of non-judgmental listening, based on respect and compassion for the other. This year, we “formalized” our Listening Circles, and were fortunate to be assisted in this move through the services of Itaf Awad, a professional facilitator who reached us via our contact with reGeneration (previously Salaam Shalom Educational Foundation). Itaf leads a bi-weekly circle for the Ein Bustan staff, as well as a bi-weekly circle for the parents. The children are not old enough yet to have their own formal “circle”, but already we feel the influence of this work on our daily interactions with each other – and through teachers and parents – on the children, as well. Itaf Awad, who leads the circles, is from Daburriya, a small town in the Galilee, near Mt. Tabor. She facilitated the Way of Council with the Sulha Peace Project, Beyond Words, Academy of Central European Schools, and many other organizations in Israel, Palestine and Europe. Itaf first heard about Ein Bustan 3 years ago via Shepha Vainstein, from reGeneration, in the US. “Shepha suggested that I visit the kindergarten, which I did. I met with Gidi, who had already initiated a parent group, and I offered my assistance to facilitate circle groups “(The Way of Council”) in Ein Bustan. 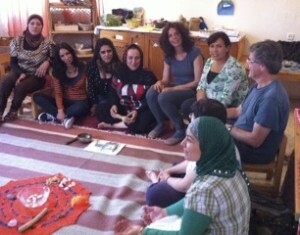 Upon my return from abroad this year, I started to facilitate circles in Ein Bustan with both staff and parents. I see circle work as a way to build community, to connect from the heart, and a way to communicate in a non-judgmental manner. I am very happy and grateful that I have this opportunity to work with Ein Bustan”. About Itaf: Itaf Awad (MA Political Science from Haifa University) served for 26 years as the city manager of Dabburyiah and advisor for women’s affairs at the Local Council and has been committed to women’s empowerment, community development, and conflict resolution for over thirty years. Itaf facilitated the Way of Council with the Sulha Peace Project, Beyond Words, Academy of Central European Schools, and many other organizations in Israel, Palestine and Europe. Itaf is the Middle East liaison for reGeneration.